Caroline of Ansbach [actually Wilhelmina Charlotte Caroline von Brandenburg-Ansbach], wife of King George II, remarkably beautiful patron of the arts and sciences, considered Handel an esteemed confidant. 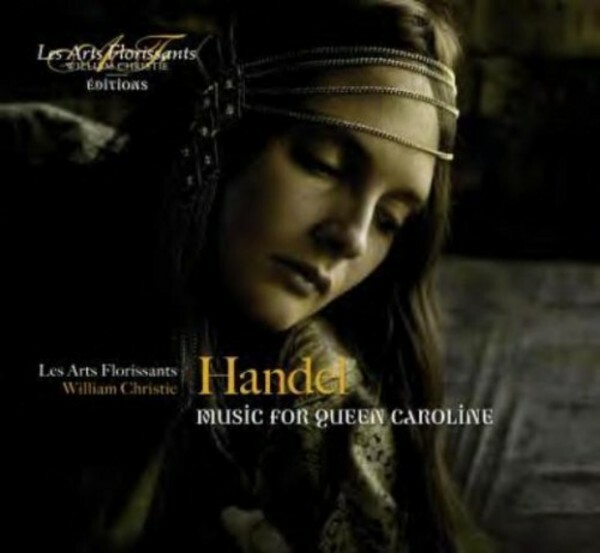 It was in Hanover that Caroline first encountered Handel, actively encouraging his appointment as Kapellmeister there in 1710, and it was apparently at her behest that he composed five of his Italian chamber duets. With the accession of the elector as George I in 1714, Caroline became Princess of Wales and, on his death in 1727, Queen of Great Britain and Ireland, consort of King George II. Three inspired works by the composer, including the magnificent Funeral Anthem, testify to the astonishing friendship between this monarch and artist. The latter was entrusted with the solemn music composed for the grand ceremonies that marked the reign: 'The King shall rejoice', given for the King�s coronation, the 'Queen Caroline' Te Deum written for her own ascension to the throne, and 'The Ways of Zion do mourn' performed at her funeral in 1737. When she died unexpectedly at the age of 54, her passing was much lamented. Quipped one irreverent wit: �O Death, where is thy sting / To take the Queen and leave the King?� This recording brings together, for the first time, three works underlining the strong link between the monarch and his favourite composer. The vocal and instrumental ensemble Les Arts Florissants is one of the most renowned and respected early music groups in the world. Dedicated to the performance of baroque music on original instruments, the ensemble was founded in 1979 by the Franco-American harpsichordist and conductor William Christie, who directs it to this day. It takes its name from a short opera by Marc-Antoine Charpentier. Les Arts Florissants played a pioneering role in the resurgence of interest in the French musical world for a repertoire which had up until then been neglected (in particular unearthing many treasures from the collections of the Biblioth�que Nationale de France) but which is now widely performed and admired: not only 17th century French repertoire but also European music of the 17th and 18th centuries. Included is a new short story, commissioned by Les Arts Florissants, by distinguished American writer Douglas Kennedy.